Targi is a two-player, worker-placement game which plays in about an hour. Players take on the roles of tribal leaders seeking to gain resources and form alliances with neighboring tribes. The game plays for 12 rounds or until one or both players have acquired 12 tribes. Players strive to attain the most victory points (VPs) by the end of the game. The tableau consists of 25 cards, arranged in a 5 x 5 play area. The outer edge is comprised of 16 permanent Border cards which provide set abilities or goods throughout the game. The inner 3 x 3 play area is comprised of random, alternating Goods and Tribe cards. As cards are acquired, Goods cards are replaced with Tribe cards, and vice versa. Players compete by strategically placing their action pawns (called Targi) to acquire gold and goods and to “purchase” tribes, with the goal of obtaining the most victory points by game’s end. VPs are gained in several ways, but the bulk will be derived from the various Tribe cards. Players cannot simply place their Targi on the Goods or Tribe cards they desire. Instead, Targis may only be placed on 12 of the 16 border permanent Border cards. The Goods and Tribe cards which the players can then potentially claim are determined by the intersection of the rows and columns occupied by their Targis. In all but the direst circumstances, Targi placement will result in two intersections, which are marked with Tribe markers in the player’s color. Furthermore, by placing a Targi figure at either end of a row or column, the player lays claim to that entire line of cards, for an opponent cannot play a Targi on the same row or column. It is this mechanism that creates the strategic and tactical choices which make Targi a great game. Targi comes with wooden figures and markers, cards, and cardboard tokens. The wooden components consist of 3 Targi figures and two cylindrical Tribe markers in each of the player colors (white & blue) and 1 neutral Robber figure. The figures are simple and functional, neither enhancing nor detracting from the aesthetics of the game. The cards include the 16 permanent Border cards which frame the play area (and are conveniently numbered 1-16). These cards are printed front and back, with one side including written instructions for how the card operates. This facilitates the ease of learning the game, but after a few plays, the non-text sides can be used, eliminating “clutter” and making for a cleaner tableau. The remaining cards consist of a small deck of Goods cards and a larger deck of Tribe cards, both of which are used throughout play. The card stock is acceptable, though not exceptional, and the art is simple and unobtrusive. Each good and tribe type is illustrated by a single image, which is more than an icon, but less than a picture. The neutral background of the cards carries through the game’s desert theme. The cardboard tokens consist of large round pieces representing gold coins; smaller round pieces representing the three goods (salt, pepper, and dates); a handful of custom-shaped Victory Point tokens (indicative of tribal jewelry); and finally, a larger first-player “necklace” token. The tokens are thick and durable, but bear the same simple art style of the cards. While there is nothing over-the-top or particularly note-worthy regarding the production quality of the game, therein lays a hidden truth: the simplicity of the art and iconography gives Targi a degree of elegance that might otherwise have suffered from excess. Targi is simple to learn and easy to play. Though more tactical decisions inevitably open up with experience, the most complex thing to grasp for a new player will be the various Tribe abilities and bonuses and the bonus victory points for acquiring similar or different tribes. Setup is straight-forward and easy. The 16 permanent Border cards are laid out in order, forming the frame of the play area. The Robber is placed on card #1. Then, five Goods cards and 4 Tribes cards are dealt out in a 3 x 3 alternating sequence to finish off the starting tableau. Players choose their colors and retrieve their Targi and Tribe markers, along with their starting resources: 4 Victory Points, 1 Gold, and 2 each of Pepper, Salt, and Dates. Starting player is whoever has last eaten dates… or the Blue player. Targi has a built in timer, limiting a game to 12 rounds. The Robber, which starts on Card 1, moves each round in a clockwise fashion. When the Robber reaches Card 16, the game ends. The corner cards (4, 8, 12, and 16) are “raid” locations which cost the players goods or VPs. The Robber does not stop on these spots, but merely passes through, triggering their effects. The game will end earlier if, at the end of a round, any player has acquired his 12th tribe. As the Robber moves, it “blocks” the card it occupies, preventing either player from placing Targis there. This becomes an additional obstacle that players must take into consideration when planning their actions and strategies. As Tribes are acquired, players place them in their own play area, forming a new tableau which can, ultimately, contain up to 3 rows of 4 cards each. Tribes must be placed from left to right in a given row, and cannot normally be moved after placement. This generates tactical considerations as many tribal abilities and victory point bonuses are dependent upon the position of the tribes within the tableau. First and foremost – tribal acquisition. Tribe cards come in different flavors and offer varying VPs and bonus abilities. Choosing which Tribe cards to include in your tableau (and which to prevent your opponent from acquiring) is crucial. Secondly – resource management. The rules limit the amount of gold and goods you can hoard, and it takes time to accumulate them. Gold is particularly difficult to come by and should not be squandered, but even salt, pepper, and dates must be expended judiciously. Thirdly – blocking. Using your Targi to effectively block your opponent’s actions while fulfilling your own requires constant focus and cunning and is a vital aspect of the game. Scoring is relatively simple and primarily determined at end-game. One particular Goods card grants an immediate victory point, and one of the permanent Border cards permits a player to trade goods or gold for victory points, but the majority of VPs will come from the Tribe cards acquired by the players during play. Each Tribe card is, itself, worth 1 – 3 VPs. Some Tribe cards grant additional VPs if certain other tribes are in the player’s tableau, or dependent upon their own position in the tableau. Finally, for each row that contains 4 of the same type of tribe, 4 bonus VPs are earned; while for each row that contains 4 different tribes, 2 bonus VPs are earned. Player interaction is limited primarily to blocking maneuvers to keep your opponent from obtaining cards that will benefit his position. While the interaction is limited, it is also constant. Every turn you will find yourself seeking opportunities to disrupt your opponent’s plans while furthering your own. This creates tension and excitement. Targi is an excellent game, offering fun and tight gameplay with just the right amount of strategic and tactical depth in a short play time. Though it lacks visual flair, it is not without charm, and the austere artwork promotes the desert atmosphere and theme. I have been buying and playing “gamer games” for just under two years now, and I have enjoyed the process. I am thankful I checked out alternatives to Monopoly, Risk, Life, and other toy department staples. Since I began to play “better” games, I have discovered things that I like and things I don’t like in games. The wealth of material available on the internet makes finding good games easier than it has ever been. 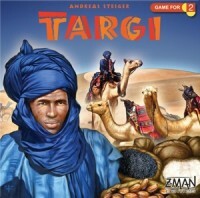 I recently purchased Targi, a two player only game from Z-Man Games. Targi is a worker placement game that uses a “board” made up of 16 fixed border cards and nine ever-changing center “goods” and “tribe” cards. A “robber” pawn is placed on the first tile, and he moves one space at the beginning of each turn. The robber commits a “raid” on the corner tiles, and players must give up goods at each raid. Players alternate placing their three pawns on one of the 16 border cards. When each players’ pawns are placed, they use the vertical and horizontal coordinates to see where the paths of their pawns intersect. They then place two markers on the goods or tribes card at the point of that intersection. It’s a mechanic similar to Forbidden Desert’s horizontal/vertical part location tiles. Next one player resolves the cards his three pawns and two markers occupy. He can choose any order in which to resolve his cards. That’s important, because one card may give a player a good he needs to purchase another card later in the same turn. So, say a player’s marker occupies a tribe card that costs one date, one salt, and one pepper to play, but he is short one pepper. If one of his pawns or markers grants him a pepper, he can take the pepper first then buy the tribe card with his goods. Most of the tribe cards give players special privileges that are good for one turn immediately, at game’s end, or permanently. A player’s tribe cards are collected and placed in a 3 by 4 grid. Certain arrangements give a player additional victory points at the end of the game. The game ends when either player reaches 12 tribe cards or when the robber pawn reaches the sixteenth border tile. The player with the most victory points wins the game. There is a lot going on during the game. A player must continually scan the goods and tribe cards to see which cards would most benefit him, and he must monitor his (and his opponent’s) ever evolving collection of tribe cards. When shifting focus from the board to one’s tribe, it is easy to overlook one’s tribe cards’ special abilities or bonuses. I find that Targi demands a player’s attention if he hopes to do well. It is not difficult, but one has to keep up with several aspects of the game simultaneously. I like Targi, and at this stage in my gamming experience its difficulty level is just right. I love the game’s box size; it is perfect for what is inside. The components are good but with a couple of minor exceptions. The border cards could be more substantial. Since they aren’t moved during gameplay, I would like to have seen the border cards printed on something like a Carcassonne tile. Additionally, the color of the robber pawn is not distinctive from that of the white pawns. More than once I have mistaken him for one of my pawns. A little paint or a sticker would help make the piece more easily identified. Targi is a fine game for two players wanting a mid-weight worker placement experience. Games last 45-60 minutes. I suspect I will grow to like Targi even more as my play count increases. Z-Man Games has several 2 player only releases, and all appear to be of high quality. I will likely check out more of them in the near future. Thematically full of atmosphere, this 2-person game has simple rules and easy-to-learn mechanics and has even earned a nomination for the Kennerspiel des Jahres 2012 in Germany. A great 2-player worker placement game. Every meeple you place gives you an action and potentially a second action on the intersection of imagined lines from your meeples, and it blocks your opponents placing options on two spaces. This means that with every placement you have to think, “what do I need? what does my opponent want? if he places there than I do that, otherwise I’ll do that” and so on. The strategy that is built around this mechanism however, is incredibly satisfying. Do you play offensively and go for the border placement that gives you the best initial option? Do you play defensively and block an opponent from playing where he/she wanted? What row has the best line up of options if you get blocked from the intersection you want? What border card gives the best ability without sacrificing resources you will need to buy things? Many crucial decisions that add up to a fantastic game without simultaneously adding unnecessary complexity. Once you have learned in the first game, the simple but challenging mechanisms, often immediately follows the second and third game in which you slowly get a feel for the depth and complexity. Again and again You can find new ways to optimize Your own turn and leave as little room for the opponent tactics. This is always faced with the dilemma to make the best move for yourself or block Your opponent. On top of that, the much needed tribal card does not always show up if and when You would have liked. Who uses his chances and possibilities best wins – often only with the crucial one or two points ahead. The high replay ability appeal of Targi is due to the often very close results, again and again to discover new ways and tactics and to take the constant dilemma of the right decisions. A really clever worker placement and set collection game with enough twist to feel fresh and new and the intersection mechanism is unique and fun to play. The game material is attractively illustrated and of very good quality. The game play is well supported by the clear and unambiguous graphics. The playing time is ca. 60 minutes. For me Targi is an absolute highlight among the 2-person games, which combined with a great depth and high replay ability has a considerable potential for addiction due to the comfortable playing time and great fun factor. The small package contains some meeples (Targi,tribe and robber), simple cardboard pieces for the goods and nice cards to form the player board. Clear rulebook, yet some minor interpretation issues are possible. I like the original twist of worker placement in this game and the fluid gameplay. The intersection concept and blocking possibilities makes this game challenging. Every setup is different so replayability is no issue. Add a Review for "Targi"